Vitamins are exotic molecules that are essential for the proper function of cells, but somewhere along the process of evolution, our bodies have lost the ability to make them. So instead, we need to obtain them in our diet, or in a daily multivitamin tablet. These include vitamin A, which is used to build the light sensors in our eyes, a host of B vitamins used to build specialized tools for chemical reactions, and vitamin C, which plays an essential role in construction of collagen. Vitamin D is an exceptional case: our cells can make it, but only if there is enough sunlight. The ultraviolet rays in sunlight break down a form of cholesterol in our skin to make the vitamin. In cloudy climates, however, people can go for months without sun, and the vitamin must instead be obtained in the diet. 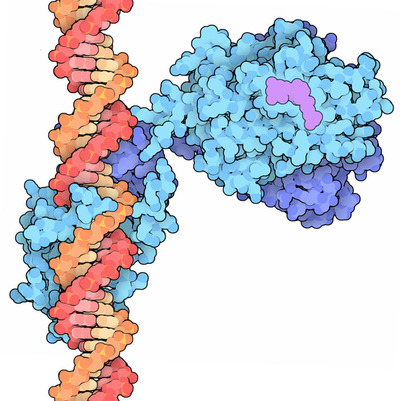 Vitamin D receptor bound to DNA, with vitamin D shown in magenta. Vitamin D plays an essential role in regulating the levels of calcium and phosphate in the body. It is converted into a hormone that is secreted by the kidneys and travels through the body. It has major effects on intestinal cells, where it helps control the uptake of calcium, and bone cells, where it helps control the formation and maintenance of the skeleton. The vitamin D hormone binds to receptors in its target cells, controlling the synthesis of many different proteins involved in calcium transport and utilization. The receptor is composed of two domains: a domain that binds to the hormone and a domain that binds to DNA. It pairs up with a similar protein, 9-cis retinoic acid receptor (RXR), and together they bind to the DNA, activating synthesis in some cases and repressing it in others. The illustration shown here is created from a structure from cryoelectron microscopy. Four atomic structures were used to build the model: structures of the ligand-binding domains from PDB entries 1dkf and 1db1 , and structures of the DNA-binding domains from PDB entries 1ynw and 2nll . You can take a look at the electron micrograph data at the EMDataBank. Vitamin D is not active as a hormone--instead, a few chemical changes must be made. These are performed by enzymes that add hydroxyl groups to vitamin D. One of the enzymes is shown here at the top (PDB entry 3c6g ). It uses a heme group to perform the reaction. Once the hormone is made, it must be delivered to its target cells. This is a challenge, since it is not particularly soluble in water. 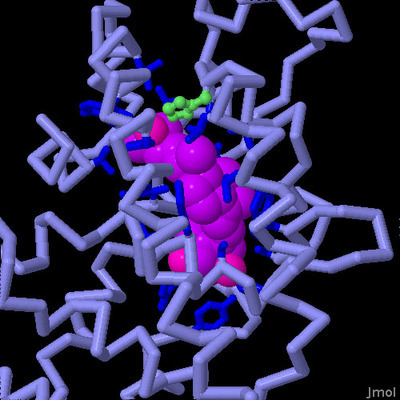 So, a special vitamin D binding protein, shown here on the bottom (PDB entry 1j78 ), is used to chaperone individual molecules of the hormone to their sites of action. 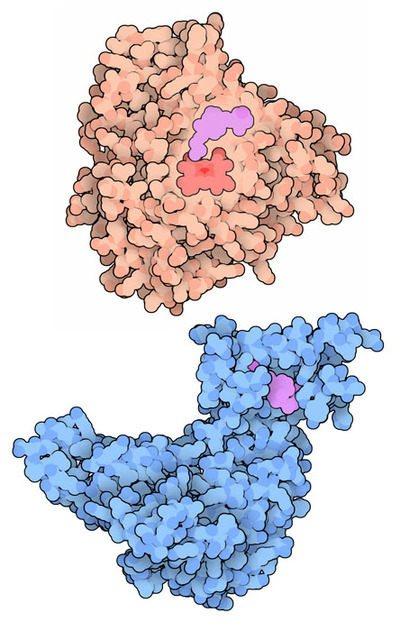 Cytochrome P450 2R1 (top) and vitamin D binding protein (bottom). Vitamin deficiencies often cause disease, such as night blindness from lack of vitamin A or scurvy from lack of vitamin C. Vitamin D deficiency in young people can lead to rickets, causing the formation of weak bone structure. This can be caused in several ways: vitamin D can be missing from the diet, or the machinery for processing and sensing vitamin D hormone can be faulty. PDB entry 3m7r includes the hormone-binding domain of a mutant receptor that binds only weakly to the hormone, leading to a hereditary form of rickets. To compare this mutant receptor with the native receptor, click on the image for an interactive Jmol. Researchers are working to develop molecules similar to vitamin D to use as drugs to cure vitamin D related diseases. You can find structures of many of these experimental molecules in the PDB. The vitamin D receptor is similar to other nuclear hormone receptors, such as the estrogen receptor. You can use the Compare Structures tool at the PDB to look for these similarities. I. Orlov, N. Rochel, D. Moras and B. P. Klaholz (2012) Structure of the full human RXR/VDR nuclear receptor heterodimer complex with its DR3 target DNA. EMBO Journal 31, 291-300. J. W. Pike, M. B. Meyer and K. A. Bishop (2012) Regulation of target gene expression by the vitamin D receptor - an update on mechanisms. Review of Endocrinology and Metabolic Disorders 13, 45-55. J. Zhu and H. F. DeLuca (2012) Vitamin D 25-hydroxylase - four decades of searching, are we there yet? Archives of Biochemistry and Biophysics 523, 30-36. M. R. Haussler, C. A. Haussler, L. Bartik, G. K. Whitfield, J. C. Hsieh, S. Slater and P. W. Jurutka (2008) Vitamin D receptor: molecular signaling and actions of nutritional ligands in disease prevention. Nutrition Reviews 66, S98-S112.